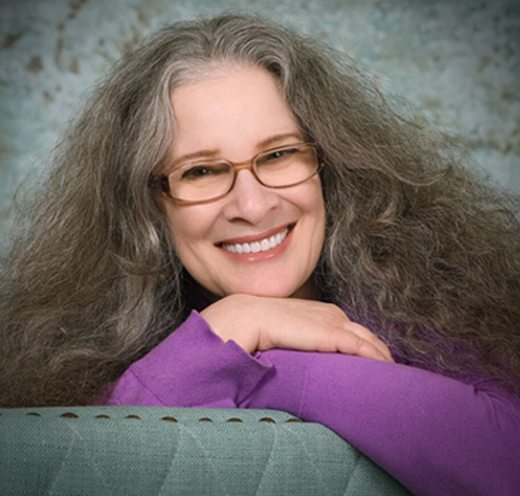 Paula Berinstein is the former producer and host of the popular podcast, The Writing Show. She lives in Los Angeles. I love mysteries, and I’ve always wondered if I could write them. But before I could start, I had to invent a detective. I wanted it to be a woman because I thought I could get inside a woman’s head better than a man’s, and I wanted her to be unusual. I came up with the idea of a young woman who would rebel against her upbringing. Her family would be intellectual and college-educated, but she wouldn’t want to be anything like them, so she’d become a plumber. And so I made her a plumber’s apprentice. In the first story, she’d find a dead body under a house when she crawled underneath to fix a pipe. I got the idea of her being descended from the fictional character Inspector Lestrade because unlike Amanda, I love Sherlock Holmes and I wanted to use him in the story, but only indirectly. Trying to follow Conan Doyle’s amazing act was just too intimidating, so I didn’t want to write about Holmes himself. Since I like the idea of finding out more about minor characters, Lestrade was the perfect choice. I also thought that being American, I would naturally be able to write about an American character, so I made Amanda American. At first the entire setting for the story was going to be Los Angeles—specifically Woodland Hills—which I know really well. But I couldn’t make that setting interesting enough, so I moved the story to England, which is where my husband, Alan, comes from. But I still had difficulty—until I came up with the idea of making Amanda a kid. Once I did that, I was able to invent a school for her to attend, and everything fell into place. Writing for kids allowed me to come up with some crazy ideas, such as a sugar conspiracy, which adults might have trouble taking seriously. Some of the names in the story come from people in my life. For example, some of the teachers’ names come from my own teachers. Miss Sidebotham, for example, was my junior high sewing teacher. Miss Also was my gym teacher. Amanda’s stick dog friends are based on real friends, although the personalities are completely different. When I was about seven, I really was in a stick dog club with two friends named Laurie and Jill. The last names I gave the girls, Wong and Javor, come from two other friends I met in junior high and am still friends with. Some of the names come from other people I know. Halpin, for example, is the name of a writer friend. Simon is the name of my son-in-law. Mukherjee, the legal issues teacher, is another writer friend. Of course none of the real people are anything like these characters either. Many of the names are made up. I invented many of them myself, either by tweaking real words, or using them verbatim. These names include Owla, from owl; Binkle, which is totally made up using funny English-sounding letter combinations; Amphora, which is a Greek jar; and Peaksribbon, which is completely made up. I can’t remember where I got Thrillkill. It probably just popped into my head, as so many names do. Some of the names are taken from places as well, like Ribchester, the name of Bill Pickle’s pickle-making rival. By the way, the name Bill Pickle just popped into my head too. There was a reason for using the name Amanda, but I don’t remember what it was now. Nick is my favorite male name, so I had to use that. I wanted the books to be as visual and full of sensory imagery as possible. Before I even started writing, I visualized a lot of color and different types of light and materials. I knew that kids love colors and shapes, and I wanted to use striking ones in my stories. I also liked the idea of candy. Who doesn’t love sweets? A mystery having to do with sweets would be so much fun. I wanted there to be danger. Every great sleuth encounters perils of all types. It would be a great twist if I were to make candy, something we all love, dangerous. And so I thought that maybe the bad guys would turn candy into a weapon. In order for there to be sufficient impact of their doing that, these would have to be powerful weapons capable of hurting many, many people. No single-person poisoning would do. Therefore, how could I make the candy essentially a WMD? I did some research, but I couldn’t find a way to make that happen short of spiking the candy with poison. I even thought of using it as a projectile, but I couldn’t make the idea work. How dangerous is a gun that shoots candy, after all? Or even a candy bomb, which might work, but why would the criminals use candy when they could just use dynamite? I was stuck—until I happened upon an article about an explosion at a sugar factory. Then everything fell into place. Sugar dust is highly explosive. It’s also relatively inexpensive. You could make very lethal weapons out of it. You couldn’t fill buildings with it and ignite them, but you could build big guns that use it as a fuel. And so my sugar weapons were born. Not only were they deadly, but they were colorful and different. So now I had the concept of sugar, but white sugar wasn’t that interesting. Sure, it’s sparkly, but I didn’t think it made a great visual. That was when I came up with the idea of making it pink. I considered other colors, but in the end, pink was the liveliest without being overbearing, like, say, red would be. Blue and green were all right, but not quite as exciting, and yellow and orange were just yucky. So, pink it was. I followed the same principles with the second and third Amanda books. I liked the idea of including a color in the title and basing the story on that colorful thing. 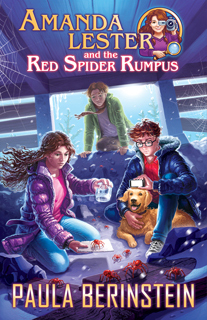 When it came to “Amanda Lester and the Orange Crystal Crisis,” I also liked the idea of luminescence, which is a characteristic of the orange crystals. The picture in my head of these beautiful orange lit-from-within glassy things is just stunning, and I wanted to share it with my readers. I liked the idea of orange because it’s a variation on the colors we use for illumination—yellow and white, mostly—and because it looks amazing next to pink. If the books were to appear next to each other on the shelf or the page, the orange and the pink would look fantastic together. Why aren’t more characters specifically named as descendants of famous detectives, such as Lord Peter Wimsey, Nancy Drew, and Hercule Poirot? Intellectual property restrictions. Holmes, Watson, Lestrade, and Moriarty are in the public domain, but most other famous fictional detectives aren’t. Getting permission to use them is possible but not easy, so I decided to avoid the problem for now and leave those sorts of names out. Why isn’t Amanda’s name Amanda Lestrade? I wanted her to be able to hide who she was and fear that she’d be discovered. Did Amanda ever repay the publican for the train fare? She certainly did. As soon as she got back from the factory explosion. Not at all. She’s much gutsier than I am. Actually, the only thing we have in common is that we’re both from L.A. Of course she gets to live in Calabasas, which I’d love to do, but it’s pretty pricey. Are any of the other characters in the story based on people you know? Only Simon, and he’s only vaguely based on a friend of mine. Well, obviously J.K. Rowling. I’m in awe of her. Her world-building is amazing. 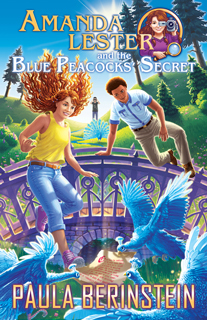 I’d also say just about every detective story I’ve ever read, including many I read as a kid, such as those featuring Nancy Drew, Trixie Belden, and the Bobbsey Twins. I was also influenced by the Edward Eager books, like Half Magic, the Oz books, and the Mrs. Piggle-Wiggle books, as well as fairy tales. My favorite writers of adult fiction include Elizabeth George, who writes the Inspector Lynley mysteries, Val McDermid, especially the Tony Hill stories, C.J. Box, who writes the Joe Pickett books, and of course, Conan Doyle. I am also a huge fan of Charles Dickens. A lot more than you’d think. For this first Amanda book, I researched everything from the sugar mile in London to viruses. I also gathered lots of images, such as those of UK boarding schools, factories, the roads between Windermere and Edinburgh, and even English trains and train stations. I’ve already written the next two books in the series, and I did at least as much research for those, if not more. How did you change the story after you completed the first draft? The biggest change I made was in softening Amanda and her relationship with her parents. I made her much more combative at first. Many of my test readers didn’t like that, so I ended up making her less angry and her parents less overbearing. I thought the way I wrote her originally was fine, and so did my husband, but some people didn’t get Amanda that way, so I tried to make her more likeable. She can still be prickly, of course, but she’s not quite as difficult as she was. How can you kill off so many characters? Easily. Their deaths serve the story, and anyway, they’re fictional. You can’t really hurt them. When you write a series, you have to be careful not to leave loose ends. If you leave your characters in danger at the end of a book, you have to let your readers know what happens to them. Likewise, if mysteries arise in one book, they need to be solved—not necessarily in the next book, but eventually. It’s easy to become confused. I like to have a lot of mysteries and difficult situations going at the same time, so I make lists to make sure I don’t let them just peter out. Each time I resolve them, I cross them off my list. But then with the next book after that, they might pop up again in a different form, so I have to add them all over again. I like to wrap up many of my mysteries within a book so readers aren’t left unsatisfied, but it’s fun to keep some of them going so people want to keep reading to see what will happen. I tend to start with a premise. That usually means a character with a problem, a goal, and a set of obstacles, including an antagonist. Of course, these are the elements of a story, and you have to have them. But I look around for a conflict or a situation that interests me and seems to have a lot of possibilities for development. Then the process becomes a long series of back and forths. I think about my protagonist and how he or she might be forced into an uncomfortable situation. (I love doing that.) Then I think more about the difficult situation and what might work. In the case of Amanda, I knew I wanted her to rebel against her parents and her ancestry, and because she was a Lestrade, the logical conclusion was to bring in Moriarty as her antagonist, but also Holmes, because she resents him. With that, I had my protagonist and my antagonists, and now I had to come up with a situation in which to pit them against each other. Sounds pretty easy so far, doesn’t it? Because Amanda is a kid, she goes to school. How would her school figure into the story? Well, what if the school itself were a huge source of oppression to her? Great, that would really put pressure on her. 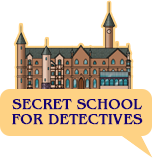 So my school needed to be something that would drive her crazy, and what better than a school to train her to be the very thing she doesn’t want to be: a detective. So, with my protagonist under pressure in a place she doesn’t want to be and villains waiting to pounce, I’ve got the bones of my story. The task now is to add more characters and obstacles, make sure Amanda has to face some hard choices, and make it fun and exciting, with a great finale. Voila! That’s it in a nutshell. Of course there’s a lot to keep track of, so I start by blocking out my story beats, and then I brainstorm and add more and more detail to them. One thing that helps me come up with and flesh out ideas is to have conversations with myself on paper. That way I can see where my ideas might take me and figure out if they’re viable. Every time I settle on an idea, more questions come up, and then I have to work on those one by one. It’s really just a series of posing questions, answering them, and taking up the new questions the answers raise. Easy to say, and less easy to do, but if I take everything one tiny step at a time, the whole thing becomes manageable, especially if I highlight the areas that need to be checked or developed. For a long time, I ran my own research business. I did a lot of work for the entertainment industry, especially screenwriters. After a while of this, I thought, “They get to have all the fun. Why can’t I write too?” So I decided I’d do that. The easiest way to break in was to write professional articles and books, and so I wrote things having to do with research. After all, that was what I did for a living, and I knew a lot about it. I also knew a lot about working with library patrons and research clients, and I wrote about how to do that as well. My first book was actually a self-study course: Communicating with Library Users. It was published by the Special Libraries Association in 1994. My next book was Finding Images Online, which was a real groundbreaker because the Internet was just starting to become popular, and no one knew how to find anything. That was published in 1996. After that I wrote more how to stuff and reference books. And then when podcasting was just getting started, I created my podcast, The Writing Show, which I produced and hosted for many years. 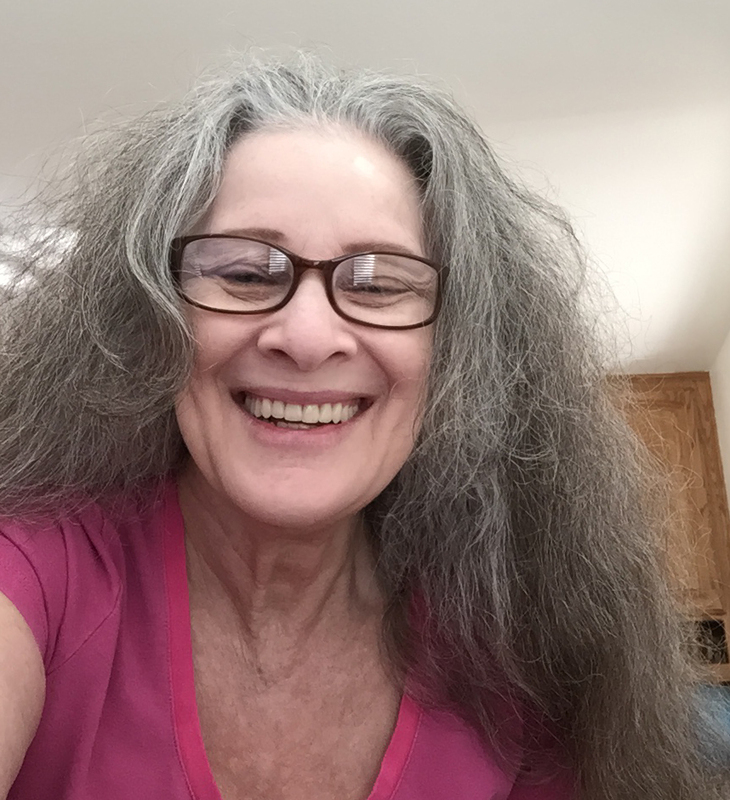 I was still writing and editing books, but I learned so much about writing fiction from doing the show that I thought I might try my hand at that. And so here I am in 2015 publishing my first novel, Amanda Lester and the Pink Sugar Conspiracy. You would not believe some of the things that are going to happen to these characters! For example, in the next book, Amanda Lester and the Orange Crystal Crisis, Amanda meets a descendant of Sherlock Holmes, who becomes a thorn in her side and a central figure in her life. 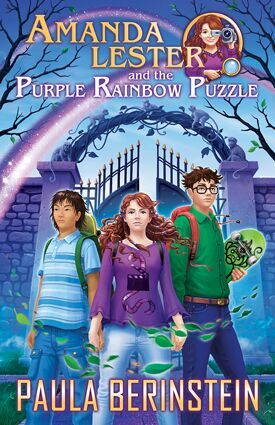 In Amanda Lester and the Purple Rainbow Puzzle, she and her friends tangle with one of the most dastardly enemies you can imagine, and it isn’t who you think. I’ve got lots of juicy surprises in store. You’ll see.